A – Eastern European burnished silver gilt pricket candlestick c.1840 – 1870. Hand carved and gilded, the candlestick has a sturdy trefoil base. There is also an original drip pan for candle wax. B – Eastern European burnished silver gilt candlestick c.1840 – 1870. 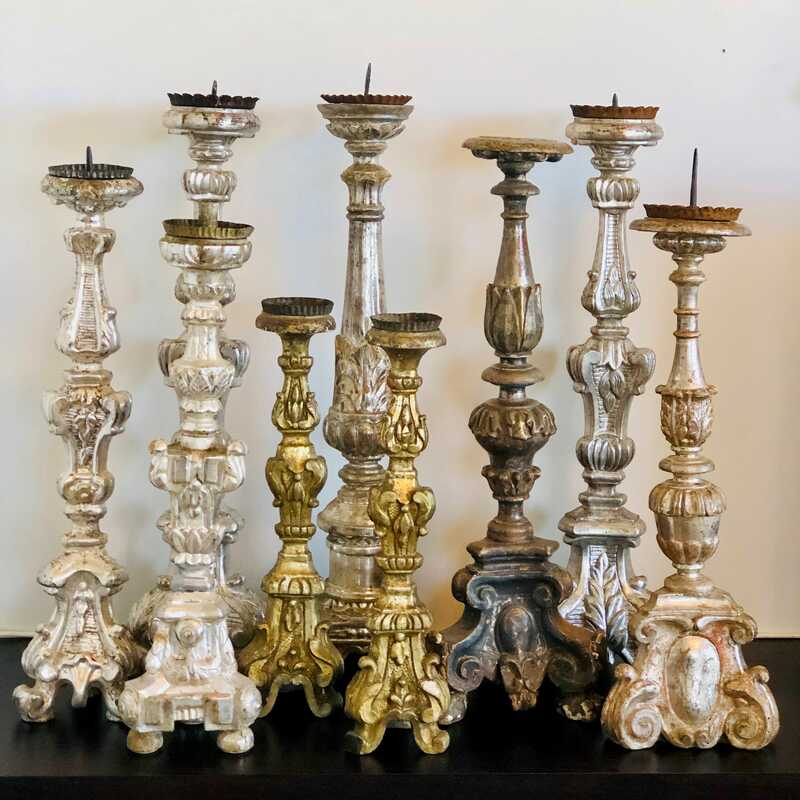 Hand carved and gilded, the candlestick has a sturdy trefoil base with a candle holder. There is also an original drip pan for candle wax. 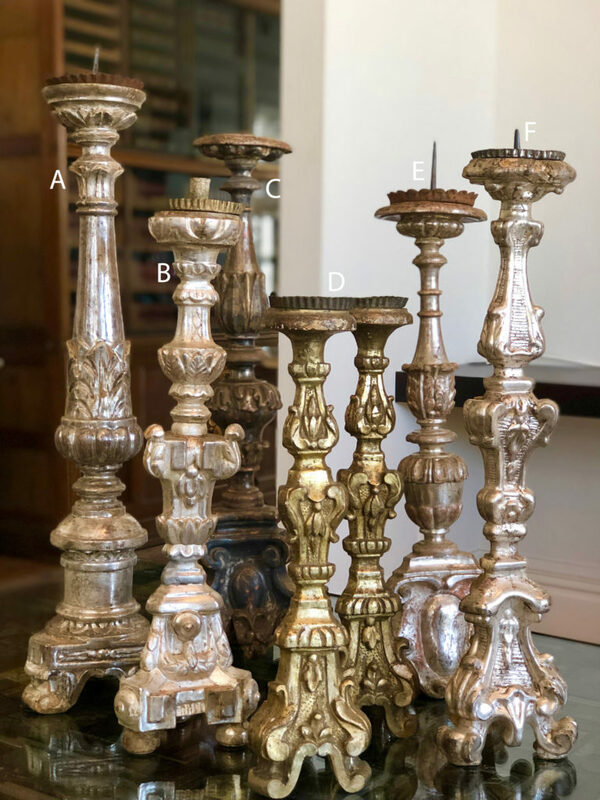 C – A single 18th century Italian pricket candlestick in faded gilt and paint (on all sides). 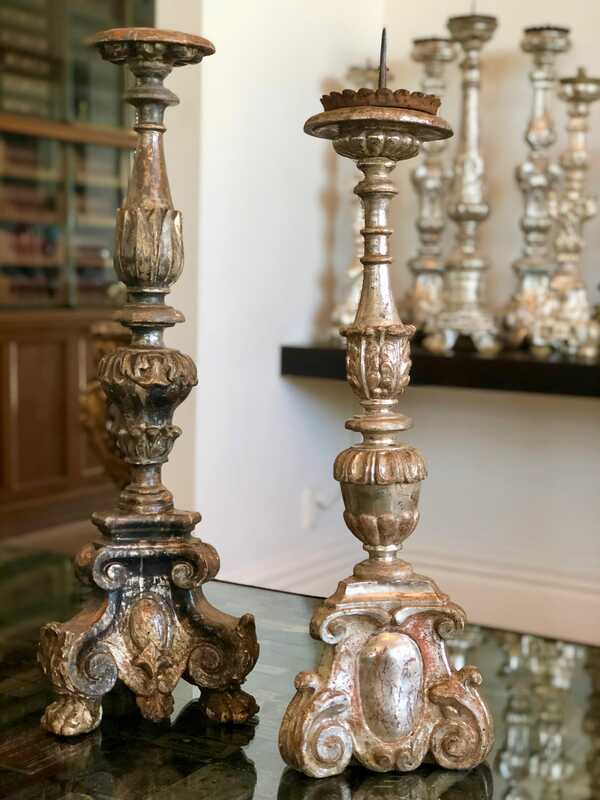 Hand carved, circa 1780, the candlestick has a sturdy tripod base with an oval cartouche, and is adorned with acanthus leaves and a long carved decorative stem. 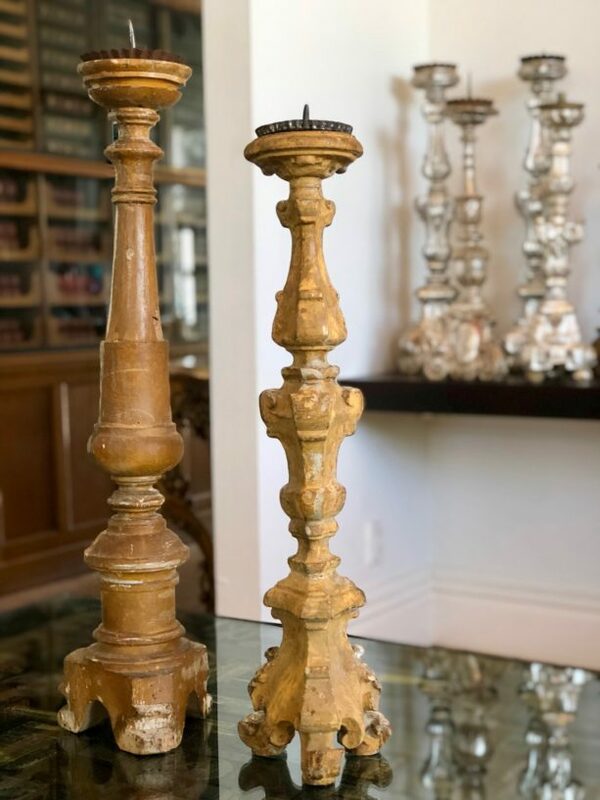 D – A pair of late 18th century Italian pricket candlesticks in dirty gilt.Hand carved, circa 1780, the candlesticks have a sturdy tripod base with three feet, and are adorned with acanthus leaves and an ornate carved decorative stem. There is also original drip pans for candle wax. 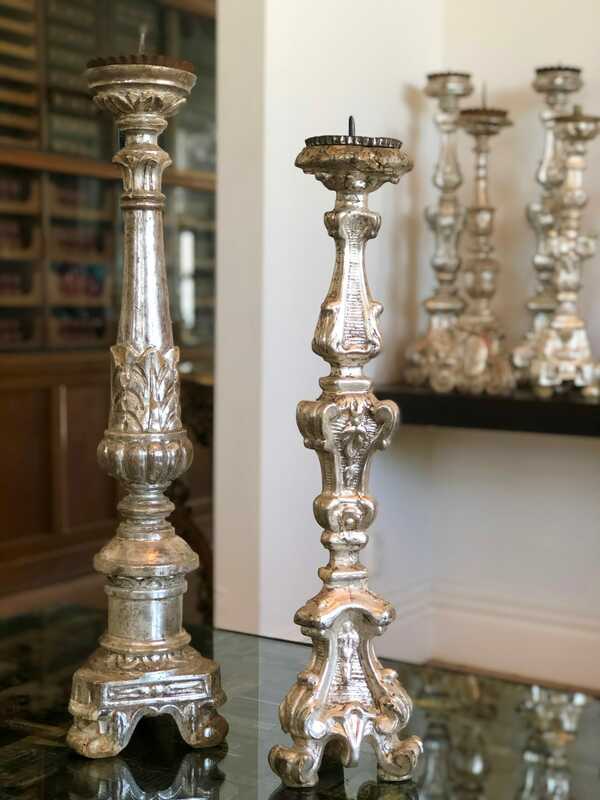 E – A single late 18th century Italian silver gilt pricket candlestick. 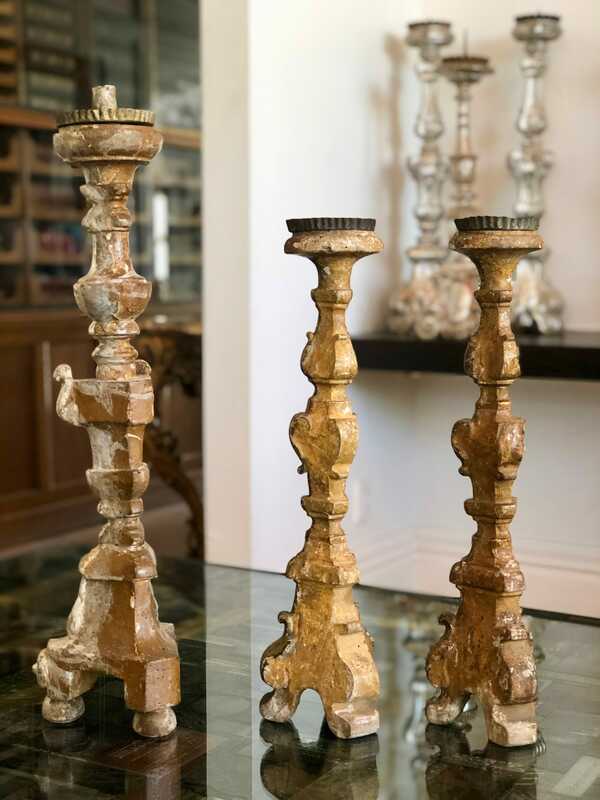 Hand carved, circa 1780, the candlestick has a sturdy tripod base adorned with acanthus leaves , and a long carved decorative stem. There is also an original drip tray for candle wax. 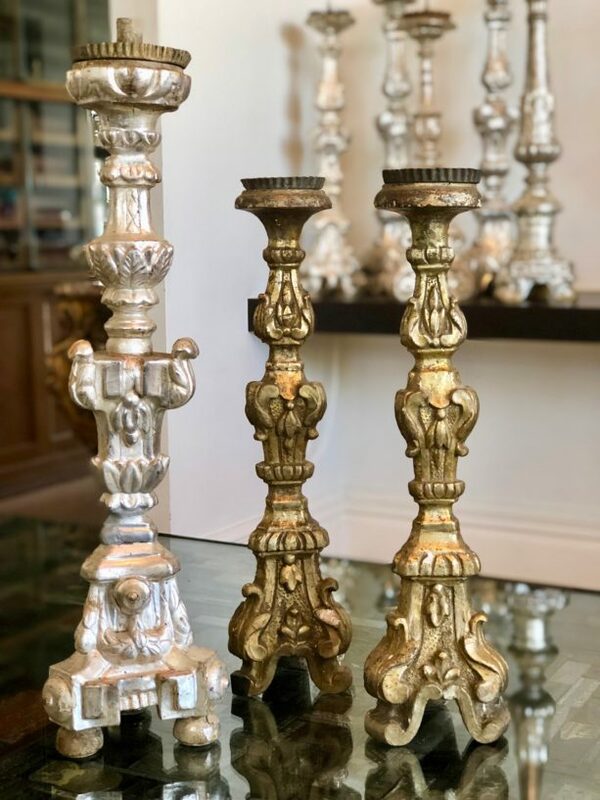 F – A single early 19th century Italian bright silver gilt pricket candlestick. Hand carved, circa 1830, the candlestick has a sturdy tripod base with three feet, and is adorned with acanthus leaves and a long carved decorative stem. There is also an original drip pan for candle wax.